Do you follow the Light Side, or the Dark Side, of the Force? That is the question. 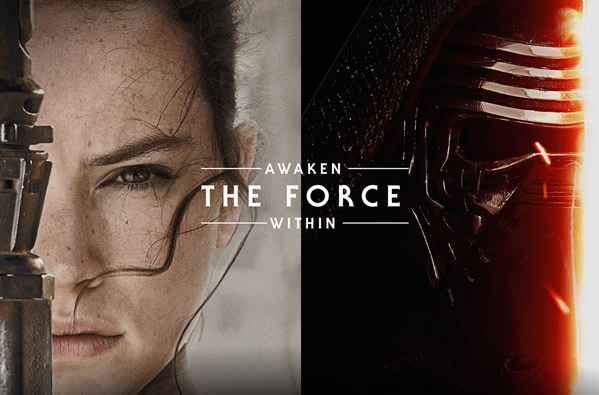 With the release of the new Star Wars just weeks away, marketing crossovers are appearing all over. One of the latest takeovers is Google going all out and hiding Easter Eggs in their website. The first one appeared when fans discovered that if you type "A long time ago in a galaxy far far away" into the search bar, the website turns into the opening text crawl from the movies. 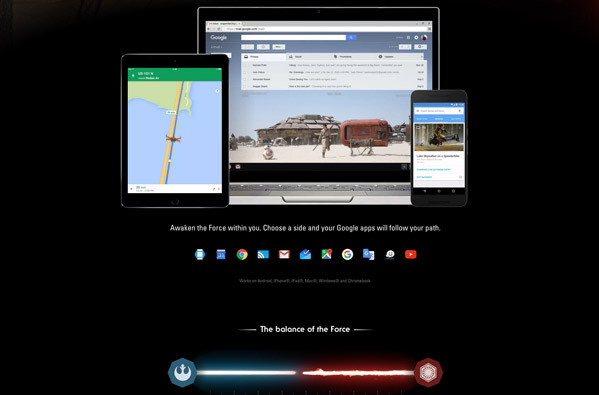 Google has also launched official themes as part of a new website where you get to "Choose Your Side" - either the Light or Dark Side - and it adds images to your Gmail and Google Maps and everything. If you use Google apps all the time (like me) you'll want to take a closer look at this. There's even a meter at the bottom tracking whether the Light Side or Dark Side has more votes from fans. Click any image above for more info and to head straight to Google.com/StarWars and "Choose Your Side". When the right side is the Dark side.